We all grow up with myths. Myths about place. Myths about history. Myths about family. Growing up is, in part, about the sifting process that takes us from a world of myth to one of truth. Abi Maxwell’s The Den tells the story of two pairs of sisters, separated by one and a half centuries, but who are inextricably linked by myth. Located in a small New Hampshire town surrounded by wilderness, both pairs of sisters are separated by one’s decision to leave – a decision forced by what their small towns will and will not accept from a young woman. Told in alternating points of view – eventually getting around to all four – the story focuses on the more recent pair of sisters, Jane and Henrietta. Jane, the younger of the two, is haunted by her sister’s abrupt disappearance, her role in the false accusation of Henrietta’s lover, and the story that has been recorded about a family who once dwelled in the same spot. As Jane comes into her own, she begins to realize that in order to have real peace about the place she calls home, she’ll need to look directly into the myths she’s believed and sort out once and for all, fact from fiction. In doing this, she may find better truths than what she had expected. Maxwell’s book should appeal to those who enjoy the themes of sisters, lore and nature. What started slow for me, came together as an enjoyable read in the end. 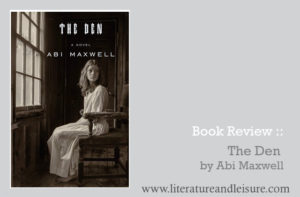 I was provided an advanced readers copy of The Den by Penguin Random House’s First to Read program in exchange for an honest review. To learn more, go to firsttoread.com. The Den will be available to all readers on May 14, 2019.